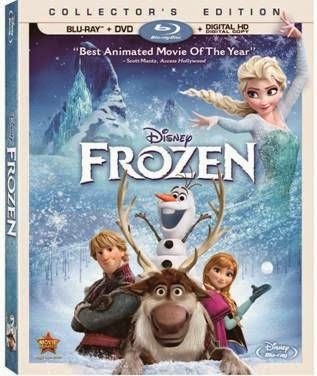 There is such amazing interest in "Frozen" that we compiled this page for folks that just can't get enough. 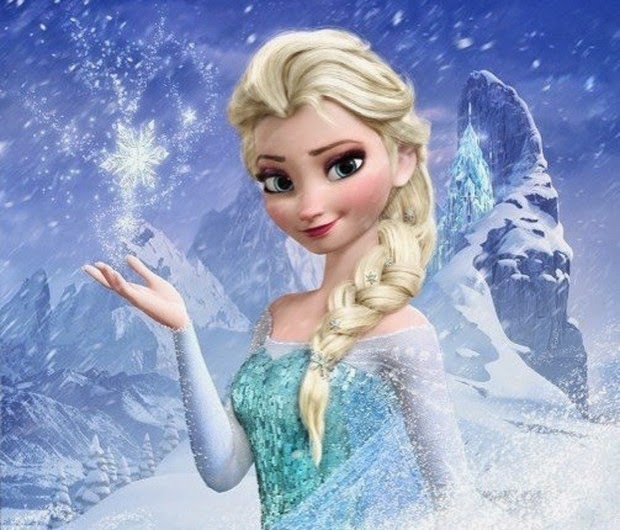 We reveal the secret images in "Frozen" and little-known facts Princess Elsa. 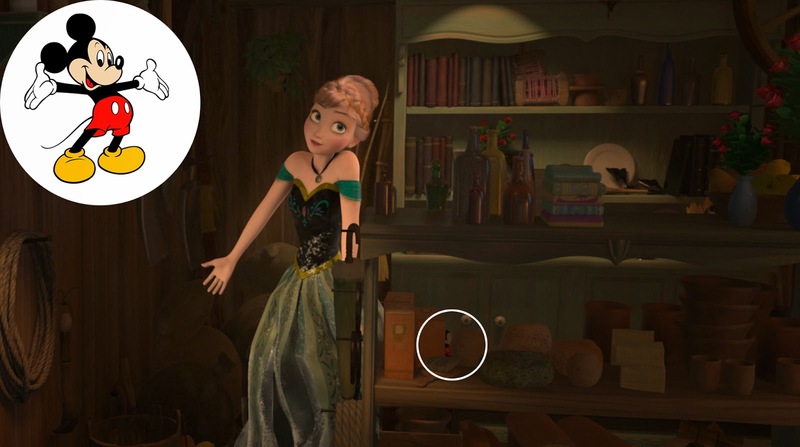 There are all sorts of hidden treats in "Frozen." Let's take a look, one by one. We'll also try to give a little background. "And 'Frozen' wins the Academy Award!" Anyway, the Fragonard reference is an in-joke. 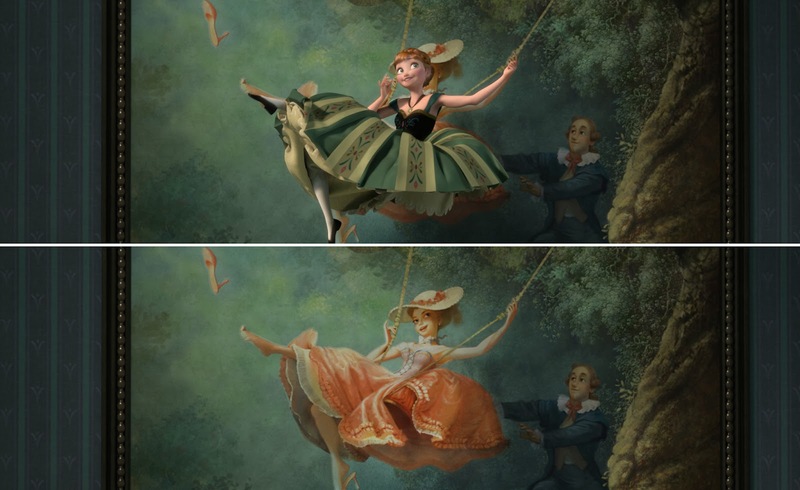 When Disney was making "Tangled," the animators took as their inspiration the Fragonard painting "The Swing" (for some reason, Lisa Keene apparently didn't receive a credit on "Tangled" at all though it appears she did some concept art for it). 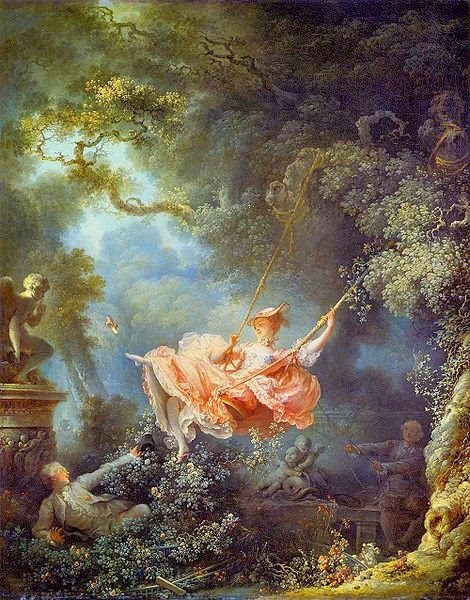 "The Swing" provided a certain oil-on-canvas look that gave "Tangled" a classic feel. The free-spirited girl in the swing is what Disney has been shooting for recently in its portrayal of female leads, a carefree, joyous spirit. There probably was the added benefit to Keene using it that the animation studio already had dissected the Fragonard painting and had plenty of worked-up, unreleased treatments of it for Keen to work with. Notice by comparing the animated version to the original painting how, in her version, artist Lisa Keene emphasized the flying shoe (carefree joi de vivre) but dropped the hidden lover (infidelity) in the bushes, and emphasizing instead the drone pushing her (commitment). The original painting is about the guy watching in the bushes, a voyeuristic quality that puts him and you the viewer in the same position, both watching the naughty but happy girl. The makes you the viewer part of the illicit transaction, with the oblivious gentleman pushing the swing unaware of both him and you. Without the fellow in the bushes, the painting is just about a free-spirited young girl having fun with her (inconsequential) boyfriend. It's all about the princess in a Disney Princess animated film. Very Disney-like changes. As background, Jean-Honoré Fragonard was a French painter and printmaker who lived from 1732 to 1806 in Paris. The man worked like a madman, painting some 550 quality paintings during the final years of the French Monarchy. "The Swing" is one of his more interesting paintings, because it shows a man pushing a lady on a swing while another man, hidden from the guy pushing the lady, is watching the lady fly up into the air. It is pretty clear that the hidden fellow is looking up the lady's dress, but she doesn't care, perhaps because they are having an affair and the first fellow - boyfriend/husband/whatever - is clueless. That may explain why she looks so happy. This kind of ribaldry was frowned upon in serious paintings back in the day, but Fragonard earned a good commission for it anyway. I mean, it's a good painting, and I'm not just saying that because it's old and respected. But he was pushing the limits with this during that puritanical age. 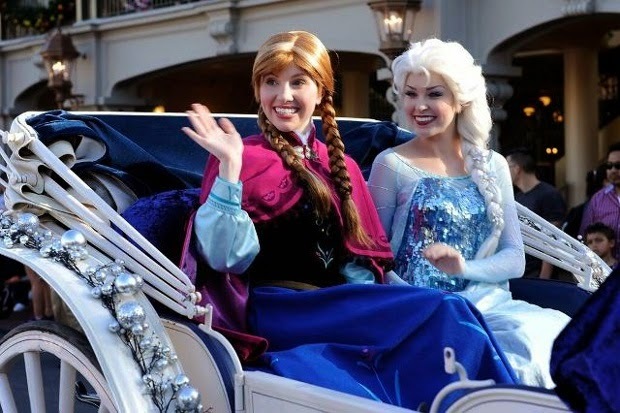 Princesses Anna and Elsa are the heart of Disney's "Frozen." There's no question that audience members respond to them and have made them into the most popular Disney princesses in years. They meet their subjects daily at Princess Fairytale Hall in New Fantasyland in Walt Disneyworld, Orlando, Florida. 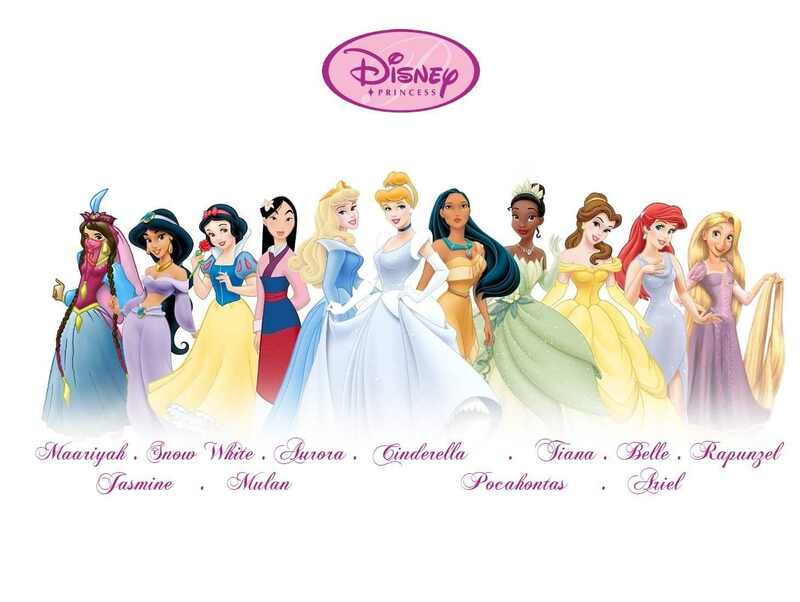 They also are scheduled to be formally inducted into the official Walt Disney Princess line-up some time this summer. Broadway actress Idina Menzel voices and sings Elsa, including "Let It Go." Elsa is the elder siser and has the best songs, such as the famous "Let It Go" which won an Oscar for its songwriters. 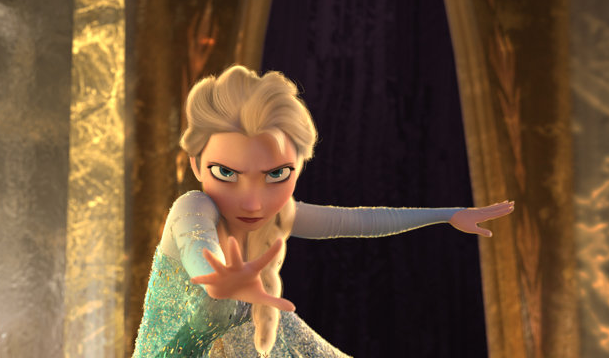 If there is one thing that audiences take away from "Frozen," it is Elsa singing "Let it Go." Many young girls like to sing "Let It Go" and want to know everything they can about Elsa. She is a very popular greeter at Walt Disney World in Orlando, with waits at the Norway Pavilion to meet her reported to last for hours. 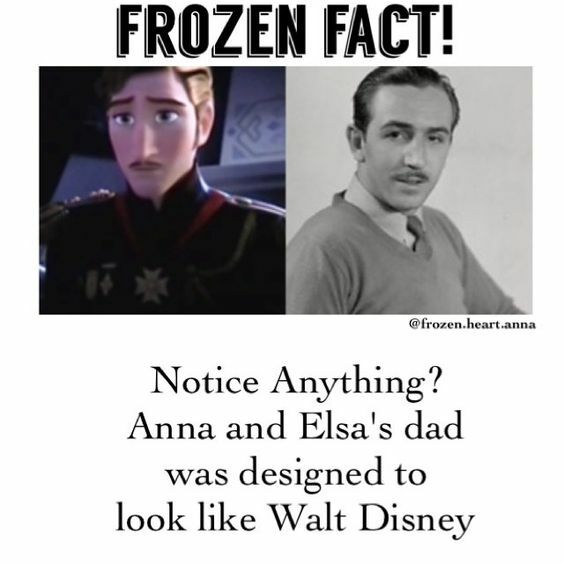 However, even the most ardent fan of "Frozen" may not know all that there is to know about Anna's big sister. Here are nine facts about Elsa and how she relates to the other Disney princesses that you may not know. 1. Her full name is Elsa the Snow Queen of Arendelle. Isn't that a lovely name that is easy to say? Very courtly. 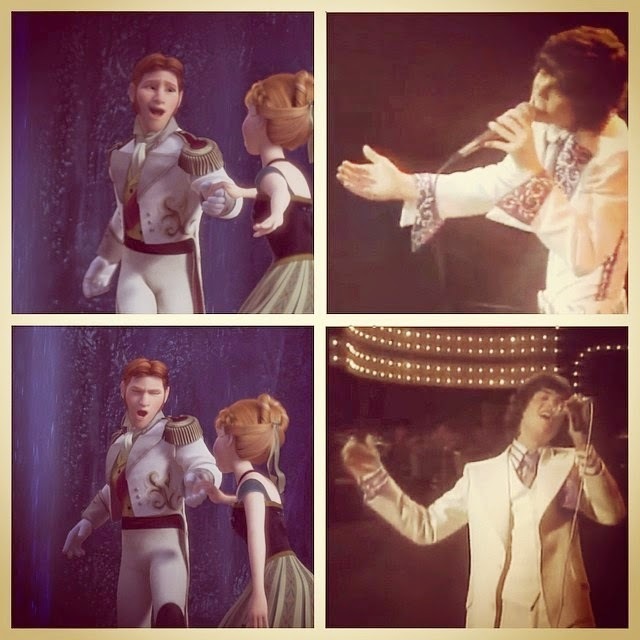 Elsa's full name itself is like a song. 2. The character is very loosely based on the titular character in Hans Christian Andersen's fairy tale "The Snow Queen." 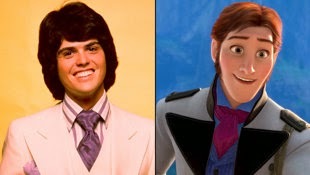 While The Snow Queen was completely evil and the main character of the original tale, that is not the case in "Frozen." Officially, Elsa is not the antagonist but rather what is known as a deuteragonist. That's the second most important character in a story. In "Frozen," Anna gets the most attention and is the protagonist, or central character. 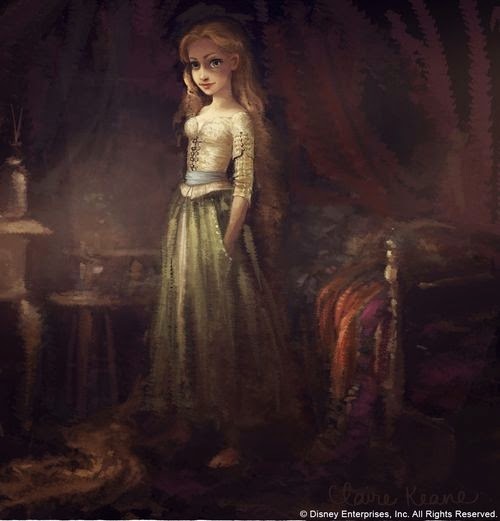 While Elsa may be the most exciting character, she is not the one who goes searching for her sister, that is Anna. 3. 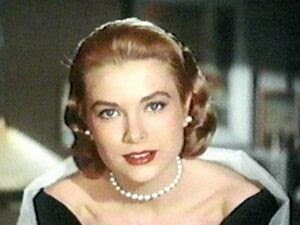 There is a lot of speculation that Elsa was inspired by a real-life princess, Princess Grace Kelly of Monaco. While Princess Grace died in the 1980s, many people remember her elegance and refinement. Princess Grace was an American actress who married into royalty and thereby became a world figure. 4. Elsa's look completely changed during the making of "Frozen." Originally, she was going to have dark hair before becoming The Snow Queen, to give her a punk look. The hair would have been short and with fierce. Ultimately, they decided that was the wrong look for Elsa. 5. Both Elsa and Anna love chocolate. They share another sisterly trait: they both have freckles, though they are sometimes hard to see. 6. The Technical Directors at Disney had to create entirely new software to accurately show Elsa's famous braid. It's not nearly as simple as they made it look, and since it is her signature hairdo (like Merida's in "Brave"), it had to be just right. 7. Elsa is going to become an official Disney princess, just like "Cinderella" and "Princess Aurora." Elsa will be the 13th official Disney princess, and Anna will be the 14th - or is it the other way around? That's a huge promotion for any Disney character, only the cream of the crop become official Disney Princesses. That means she will get her own doll line and other perks. 8. While it may see as though many Disney Princesses have special powers, that is not the case. In fact, Elsa is only the second Disney princess to have special powers: Rapunzel was the first . 9. Elsa is only the second Princess in the Disney universe to not have any love interest. Even Anna has a love! That may be because Elsa has to lock herself away in her own castle and nobody comes to visit. How sad! In fact, she is only the second princess to not find love, the first being Merida. Maybe she will find someone in the sequel? Here's hoping!